In MYOB EXO the receive multiple debtor payments enables entry of payments received and grouping in one step. You can use this screen to enter all cheque payments received and banked in one entry, or all EFTPOS transactions put through the bank in one day. If payments have already been entered into MYOB EXO Business using the single debtor payments screen, they can be batched later for reconciliation purposes using Debtors banking batches. The following procedure shows a combination of cheques and a cash payment that are being banked together. 1. Click on the button and select Debtor Payment Batch Entry. 2. Create a new multiple payment. Click New. 3. The system will assign a new sequential banking batch number. 4. Enter receipt header information: such as Receipt date, Payment Group, Bank account, Branch, Age, etc. • Payment Group defines the GL account to use and whether bank fees apply. • Select the Bank Fees option if you need to enter bank fees that relate to the batch, ie fees relating to Amex transactions. 5. Enter debtor payments — Debtor Account, Payment Type, Amount and other payment details. 6. Aged balances for the selected debtor account are displayed on the bottom panel of the screen. Use these to check that you have the correct amount. 7. Make sure that the payment amount entered matches the cheque amount to avoid problems with the bank reconciliation. 8. Set Posting requirement. Review the POST to GL option and set as required. It is recommended that the Post to GL option is left unselected as changes cannot be made once the batch is posted to the GL. If you wish to totally disable posting from the Debtors Receipt Batch Entry screen, contact us. 9. Set Allocation requirements. Select the Auto Allocate option if you want MYOB EXO Business to attempt an automatic allocation of the payments to debtor invoices. Auto allocation will only occur if there is a direct match between payment amount and invoiced amount. 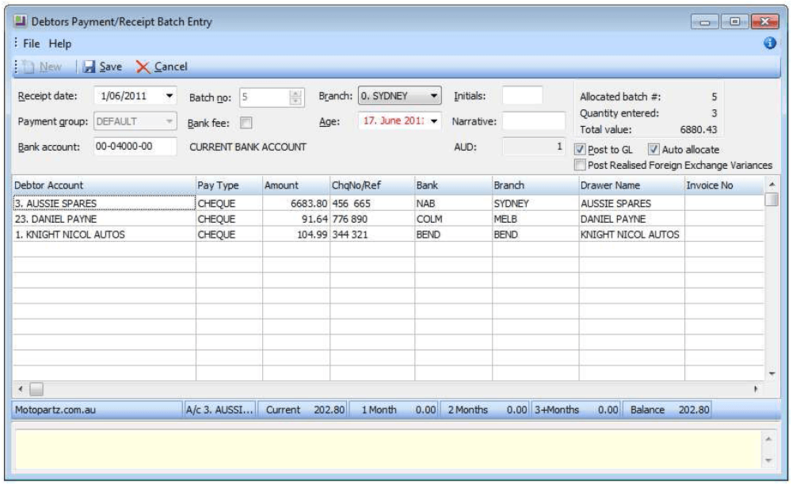 Any invoices not auto allocated will need to be manually allocated (Refer to ‘Allocating Payments’ on page 10 for more information). 10. Choose the option to Post Foreign Exchange Variances if you wish to post any realised foreign exchange gains or losses. 12. Save the payments. Click Save to save the batch payment transactions and you will be prompted to print the batch summary.